The moment you put your invitations in the mail marks a big step on the path to your wedding day. Before reaching this milestone, there are a number of important things to consider. Here are some tips for creating and mailing invitations that reflect your personal style. From when to send them, to what they look like and what they say, a lot of thought and decisions go into your wedding invitations. 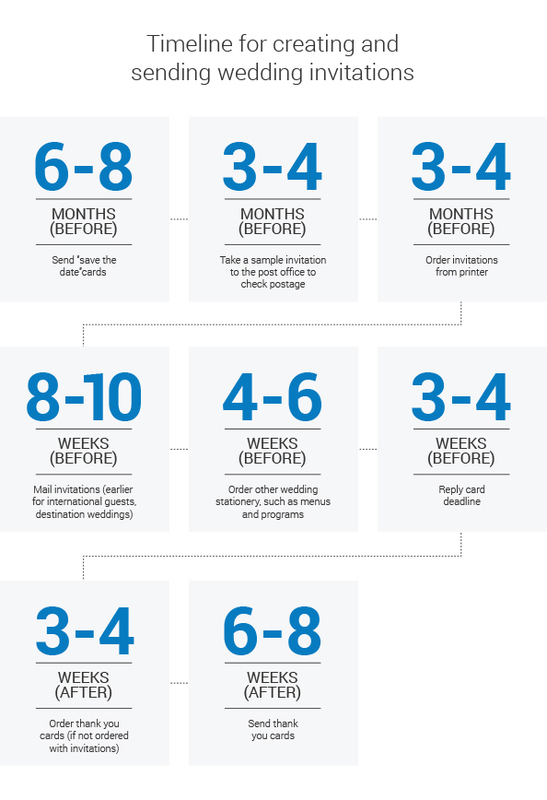 Try to have fun with this big step in your wedding planning process. Your invitations can be formal or funky, luxurious or laid-back. Let them express the style of your wedding and set the tone for the big day to come. For the most elegant and lavish wedding, think embossed printing on heavy paper stock, with lined envelopes and a separate inner envelope. If your personalities are more laid-back or your big day will be less formal, get creative with your printing and paper choices. Skipping the inner envelope and using a postcard for replies sets a more relaxed tone. For a really personal touch, consider printing the invitations yourself. Attractive papers are readily available in craft and stationery stores or online, along with handy templates for printing, letting you DIY without sacrificing on style. When planning your budget you’ll find that printing costs vary widely—from as little as $1 per invite to as much as $30 for high-end printing options. 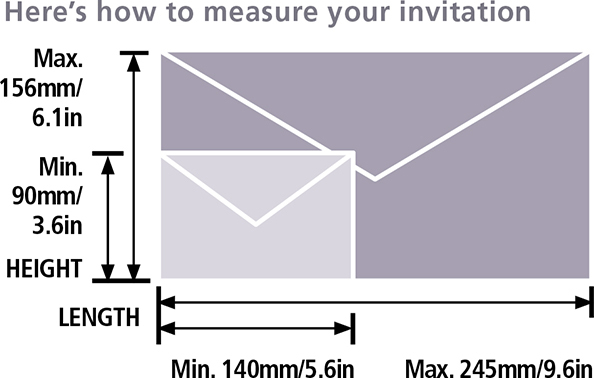 The cost of postage for your invitations will depend on the weight and size of your invitation, and how many you’re sending to the U.S. and overseas. Have a look at the mailing tips below or take a fully-assembled sample invitation—including all envelopes and inserts—to your local post office to confirm the cost. Include stamps for your reply cards. It’s proper etiquette to pre-stamp them for your guests. You may be able to pre-stamp reply cards for U.S. and international guests too. Visit the website for their country’s postal service to purchase postage. Keep other wedding mail in mind too, such as engagement announcements or party invitations, “save the date” cards and bridal shower or Jack-and-Jill party invites. To use a single domestic stamp on mail within Canada, your invitation must be rectangular or square, within standard measurements and no more than 5 mm thick and 30 g.
Addressing your wedding invitations by hand adds a personal touch and is considered the best etiquette. Whether you hand-write the addresses or print labels, be sure the addresses are in the right format. For U.S. and international mail, add the country on a separate line below the rest of the address. 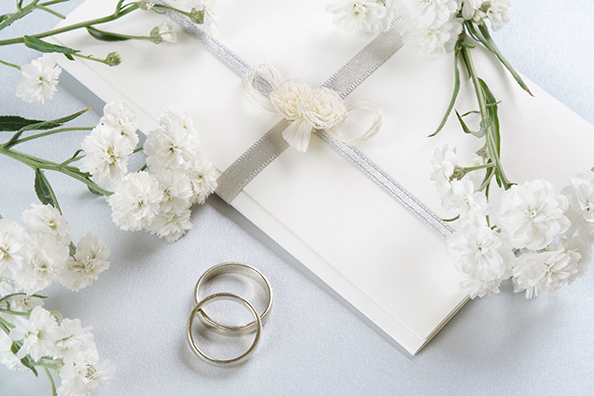 Your choice of postage adds a finishing touch to personalize your wedding mail. Pick stamps to match your wedding theme or your interests as a couple. Or stick with a classic floral wedding theme. Another exciting option is to create personalized stamps, featuring a design or photo of your choice—such as an engagement picture. This adds a lovely custom touch to your wedding mail and lets guests know they’re part of something special from the moment the invitation arrives. Wedding invitations get most of the attention, but your thank you cards are just as important. Make sure to hand-write a personal note mentioning the guest’s gift. If the guest gave you money, don’t specify the amount, but if you’ll use the money for something other than paying for your event, it might be nice to mention it (e.g., your generous gift will help us furnish our first home together). Thank you cards offer a chance to leave a lasting memory of your big day with your guests. You can have postage-paid cards or postcards printed with a photo of the two of you opening gifts, or holding a thank you banner. Or enclose a snapshot of yourselves with the guest you’re thanking or a small token related to your wedding theme, such as flower seeds. What are your creative ideas for wedding invitations? Share them in the comments below.